We are truly grateful to Dan Merton for taking on the Thames Path Challenge on Saturday the 8th of September to raise funds for our branch. Starting from Bishop's Park next to Putney Bridge at 8:30am in the morning, Dan set off on his epic 50km walk passing through leafy Kew and Richmond before reaching the halfway point at Hampton Court after 6 hours. From there Dan continued his route through Walton-on-Thames, Shepperton, Egham, and Staines, finally reaching the finishing line at Runnymede 14 hours later at 10:34pm. What a fantastic achievement, and not surprising that the following day Dan replied to our congratulatory Twitter message: "Thanks. I can hardly move today 😂 The challenge nearly broke me but it’s all for a good cause and the meows 🐱 I will be feline fine in a few days hopefully." To date, Dan has raised £1,137.50 in sponsorship, including a £500 pound for pound donation from his employers Legal & General. But, if you think he deserves more after putting in such a pawsome effort, you can donate at https://www.justgiving.com/fundraising/daniel-merton-trekking4cats or send a cheque payable to Cats Protection Horsham to the branch address at PO Box 466 Horsham RH12 1XN - just write "Dan's Walk" on the back of the cheque. Last year, Dan walked the Thames Bridges Challenge which raised £1,136.50 for us and together with this year’s figure means he has raised almost £2,300 single-handed (or should that be footed?). This is a tremendous amount which will certainly have helped a lot of cats in our care, he really is a cat champion. 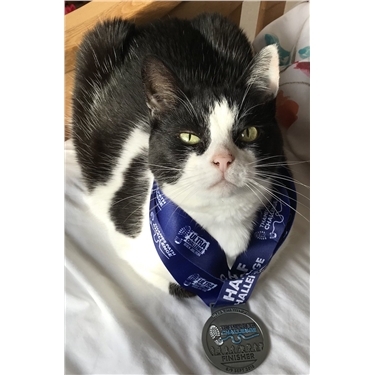 If reading this has inspired you to take on a challenge to help raise funds for us head over to https://www.cats.org.uk/challenge, where there are all sorts of opportunities from walks and runs to international experiences which you can take part in.